Eliminate binding and remove the preload on your sway bar with the CorkSport Mazda 3 and Mazdaspeed 3 Adjustable Front End Links. Made to fit OEM and aftermarket sway bars, the CorkSport End Links have +/-6mm of adjustability, use a 5/8" hex stock that will reduce end link fatigue, and have sealed end M10x1.5 ball joints for low friction and added durability. 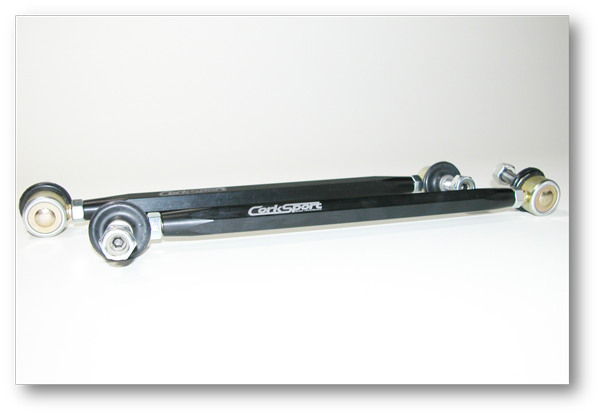 Adjustable: +/- 6mm in adjustable length compared to stock to easily tune the sway bar as part of the suspension system. * The end links have been tested and confirmed for fitment with the CorkSport and OEM sway bar. They are likely to fit most aftermarket sway bars, however CorkSport cannot guarantee fitment with a sway bar if the end link holes are not within a reasonable approximation of the OEM end link holes. So I guess end links should be replaced after 135k miles, lol. Really tightened the suspension, love these! A must upgrade over the stock links. CS links look awesome and are twice the size. I installed them with no issues. These are a great upgrade over the stock end links. They are lighter and beefier than the stock ones, and make a difference in the handling. 5 stars! does it fit on a ms6 ? What is the difference between these and the whiteline endlinks? Is the much of a difference? Will these help if your car is lowered on coilovers, or do I need longer links? THis product is amazing , the turning on my car feels so crisp and tight. I combined this product with the CS front sway bar and it's night and day difference! Work the money. Corksport products don't disappoint. Combine this product with CS front sway bar, CS front sway bar links, CS rear sway bar, CS camber arms and CS toe links and watch how your suspension improves off the back! I just ordered Megan racing coil overs and was wondering if I need adjustable sway bar links so it lines up with the hole on the strut from the coil over or will it fit fine if i use oem sway bar links if I adjust my height of my car? Will these work with the rear sway bar or are they just for the front? Can you send me the item to mexico? I have the same "clunk" sounds coming underneath the car when its is cold and hit bumps (after a while they stop). it must be my 5 year OEM endlinks. will these endlinks stop that "clunk" noise? I recently replaced my OEM's with the MOOG ones, but because of the zerk fittings, they rub when i turn full lock to full lock. These wont cause any rubbing issues will they? CorkSport Reply:There should be no rubbing issues with the end links. I could get the factory end links to deflect a little bit with my hands. These are MUCH more rigid, and made turn-in a bit more crisp. CorkSport Reply:We have not fitted them here with the COBB swaybar. will this resolve the issue of the front end clunk? i have a 2007 mazdaspeed 3. Thanks Corksport ! Does this eliminate that thump, clunk, pop kind of sound? or do i need the front sway bars? Do these fit both Gen 1 and 2 Speed 3s? CorkSport Reply >>> Yes they fit both Generations. Does this part comes with all the parts need to instulled it on my 2012 mazda speed 3? I need to know this before ordering it? >>>CorkSport Reply Yes the end links are complete, you just remove the originals and bolt these in. What is the dimensions of these from lowest to highest height? Is the listed price for one sway bar link or a set of two? IE Are you selling the link by the single part, or is this item a pair of links? buy this part more than two years, whether sold parts and not have to buy everything. Yes they will. Our endlinks are fully adjustable. Do you habe this product for a mazda 3 2015? We currently do not have them available for the 2014+ models. Any reason you guys haven't also started offering the rear end links? The angle needed to operate along with the different rear swaybars on the market make the range of motion needed very large. To get a part to market for a decent price and meet the criteria is something we were not able to meet.